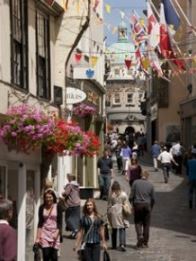 Guernsey is 75 miles below the south coast, 31 miles west of Normandy and 28 miles north-west of Jersey. It is not part of the UK, nor the EU, and it has its own parliament, its own currency and its own stamps, accepts Bank of England currency as the norm (Euro’s too) and is VAT free. It is home to just 65,000 people and incidentally 1,500 Guernsey cows (tan and white) who possess an extraordinary nice temperament, according to our tour guide, who has plenty of other interesting nuggets about this popular Island to share. This explains the quality of Guernsey milk, creamy butter (very yellow) and why the ice cream is so superior. Advice - forget the diet on Guernsey. You will eat well. Guernsey boats a colourful and controversial history. During the 11th century, it was part of the dukedom of Normandy, under the leadership of William Longsword. Following the Norman invasion of 1066, the newly crowned King William I, who was also the Duke of Normandy, took control of the island. When the Normandy territories were later ceded to King Philip II of France, Guernsey decided to side with England – and King John. To Islanders Queen Elizabeth II’s traditional title as head of state to this day is the Duke of Normandy, no matter what gender – hence a popular expression on the Island - raise a glass to the Duke. Guernsey introduced its own flag only in 1985, a design that combines the gold cross of William the Conqueror with the red cross of St George. While Guernsey is very much cosmopolitan these days – of late a notable influx of hard working Latvians have become an asset to the Island’s hospitality industry - born and bred older residents speak Guernsey French (a hard to understand Norman-French language.) The French influence however is evident in the street names. Guernsey-registered cars carry only numbers on their plates - the longer the number, the newer the car. There are regular open auctions where Islanders can trade number plates which in many cases fetch far more than the car itself. No 1 belongs to the Head of Judiciary in Guernsey, but No 2 and 3 are owned by Honda. (Honda allegedly paying £75,000 for the prestigious 3 plate). The speed limit is a maximum 35 mph, 25 mph even more common on the Island, so high performance cars are a rarity. St Peters Port, the capital, is a tiny town full of resturants and tourist shops with the narrow High Street pedestrian only. There is a very large yatch basin complex and it is popular with cruise ships, 70 mooring in The Roads this year and using tenders to transfer passengers to the main jetty. 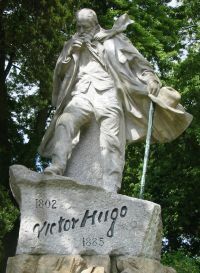 During our visit in early July Islanders and their French neighbours were preparing to mark the 100th anniversary of the inauguration of the statue of Victor Hugo in Candie Gardens. The famous French writer and poet spent the last 15 years of his 19 year exile on the island between 1856 and 1870, where he penned the globally famous Les Miserables. Guernsey was presented with the statue, now a protected monument, in 1914 by the French Government to celebrate links between Guernsey and France. During our visit the statue had undergone a £6,000 clean and repair, and was sporting new gold painted lettering, ready for the celebrations. Several of Guernsey’s hotels catering for business and leisure have undergone a substantial facelift of late to bring them in line with the popular four star boutiquey London hotels. For example, The Duke of Richmond Hotel, enhanced to a four star, alongside sister Government House Hotel, among the most upmarket now on the Island and both part of the family run Red Carnation Collection Hotels. Sister to the likes of the Chesterfield in Mayfair, Rubens in London and Hotel d’Angleterre in Geneva. It is just a short walk from the shipping and finance district with a small outdoor swimming pool. St Pierre Park, which previously held the crown as Guernsey’s best, remains popular with corporates and conference gatherings as well as weddings with their attractive grounds set in 36 acres. It lies just one mile from St Peter Port with its own golf course – one of only three in Guernsey - and modern spa, specialising in Elemis treatments and products, plus indoor pool. St Pierre Park is next in line for a major refurbishment we are told, now that it is under new ownership with Julia Hands’ renowned Hand Picked Hotels. Comfortable new beds have just been fitted, for starters. A 50 minute boat ride from St Peter Port and visitors can take in the lush green island of Sark. 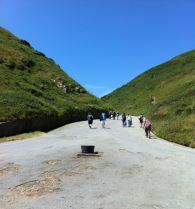 No cars allowed – just bicycles, tractors and horse drawn carriages, Sark really is a step back in time. Our particular weekend saw the population of just 600 soar to 2,000 plus as the Island geared up to host its fifth annual mini Glastonbury folk festival. Musicians as far afield as Australia descended on Little Sark where visitors pitched their tents to enjoy a weekend of country music. 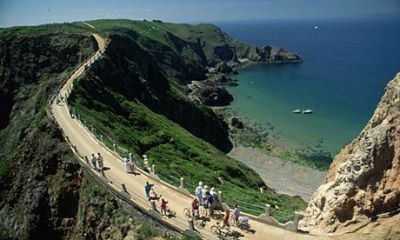 Ask my husband what was so memorable about Sark and he remarks – the cost of a pint of London Pride (£1.75) – but he agrees it is a special place, pollution free, set in a 2.2 square miles of stunning scenery with bays, headlands and coastal walks. Disembarking the boat at Maseline Harbour, one of the smallest harbours in the world – it’s either the ‘toast rack’ – a tractor ride to the top of Harbour Hill or by foot. Once up in the stunning woodland of wild flowers and birds – with several mature vineyards too, Sark is quite flat - so cycling is enjoyable. Or you can take a slow paced trek around the Island by horse-drawn carriage. Fifteen carriage drivers are employed on Sark from April to October. What do you do after October I ask Danny, our guide. I work on the farms, in the gardens, always plenty to do, he replies.